A space station at the edge of the galaxy just found a planet that’s slipping off the edge entirely. After losing control of his magic, wizard Cedric the Brown blew up his boss and nearly crashed a space station into a planet. Determined to make amends, he pledges to help the mining station negotiate with the nearby planet's mysterious, magical inhabitants. 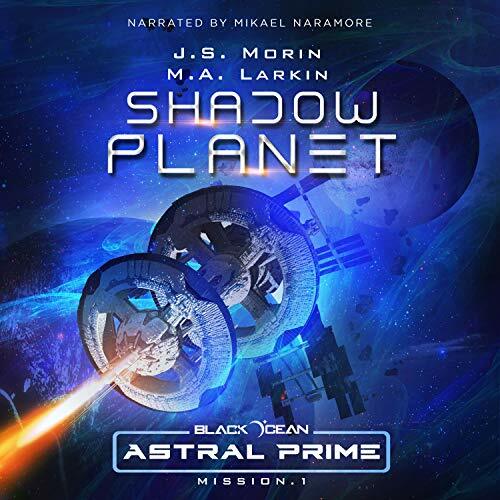 Shadow Planet is the first audiobook in the Black Ocean: Astral Prime series. It hearkens back to location-based space sci-fi classics like Babylon Five and Star Trek: Deep Space Nine. Astral Prime builds on the rich Black Ocean universe, introducing a colorful cast of characters for new and returning listeners alike. Come along for the ride as a minor outpost in the middle of nowhere becomes a key point of interstellar conflict. Although $10 for a 4 hr 42min title is a bit much, I feel I got such a great value with the 1 credit for 84 hrs of the Black Ocean Mobius edition that it was worth it. Mikael Naramore is fantastic and it was really very nice to get back into the Black Ocean with him. The story and characters are good and it was a good start to this new series, but not enough content to really consider it a whole story. I've given it a fairly high overall rating due to the potential for follow on story lines - I look forward to them. In the future, I'll wait until they combine a number of them together so I can get more than 4 hours of entertainment. The Black Ocean series has been a great ride, the well imagined characters are in an interesting universe. My problem with this story (short story?) is that is has no real conclusion, it is more like a serial installment. The end of this did not even have a climax, falling flat without any real suspense. Did M.A. Larkin miss a deadline and simply send in the partial manuscript? lots of action, science fiction and dragons! who could ask for anything more. Can't wait to listen to the next episode.